For readers of South Asian Fiction, Chitra Divakaruni needs no introduction. Her writing is mesmerising and lyrical and extremely addictive. My personal favorite is Palace of Illusions, which is the story of the Mahabharatha, narrated by the female protagonist Draupadi. 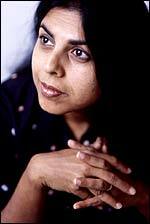 One of the most read South Asian American writers, Divakaruni's last book "One Amazing Thing" was very well received. Suprose was thrilled to have this Tête-à-Tête with Chitra Divakaruni. 1. You have written contemporary fiction, historical fiction, young adult fiction and poetry, very different writing forms… How do you switch hats, moving from one to another with so much ease? It's not really easy. Before I start a new form I have to think awhile, read some good examples in that genre, re-pace myself, remind myself why I want to change to another form, etc. 2. Which of your books so far did you find most challenging to write and why? Each is challenging in a different way. Perhaps Palace Of Illusions was the most challenging, because it retells the ancient myth the Mahabharat from a woman's point of view. I had to do a lot of research, a lot of reading, I had to find a suitable voice for Draupadi so she could be queenly & mythic as well as contemporary. I had to retell the story in a way that would still be of interest to someone who was already familiar to it, and yet not confusing to someone who had never read it. 3. There are many successful writers out there without a formal MFA, and many who have an MFA. How does this MFA degree matter, in the overall formula for being a successful writer? The MFA program is a great help in many ways. It gives you a writing community, 2-3 years of continuous workshop experience, which means people are reading your work carefully & giving you feedback to alert you to your strengths and weaknesses. You read a lot, both literature & craft, and you learn many techniques & how to apply them. You are able to work one on one with good teachers. You make connections with other writers that could last for years, with you reading each other's work even after you graduate. On a practical level, your professors can connect you up to agents & publishers & quality journals & help you find jobs. 4. Good readers make good writers. Please list at least three authors and/or books that you think are "must reads" for aspiring fiction writers and please explain why? This is of course very personal. Three authors that I have learned a great deal from are Tagore, Tolstoy, and Maxine Hong Kingston. I recommend them to my students. 5. What have been the challenges and rewards of seeing your books being made into movies? Why? Have you had a hand/say in any of the screenplays? I've only been an informal consultant for the films of Mistress Of Spices (English) & Sister Of My Heart (Tamil)--and that's all I wanted to be. The reward is that it brings you new readers. The challenge is that often you might not agree with the director's interpretation. For me, overall it has been a good experience. And of course it's exciting to see your work in a whole new way. 6. What are some challenges faced by multicultural writers who target a mainstream audience that is new to some cultures and ways of life? You have to make your work accessible and yet keep it authentic. You should never explain cultural information, but nor do you want your reader to be lost. And your readers who are from your own cultural background should not feel alienated.